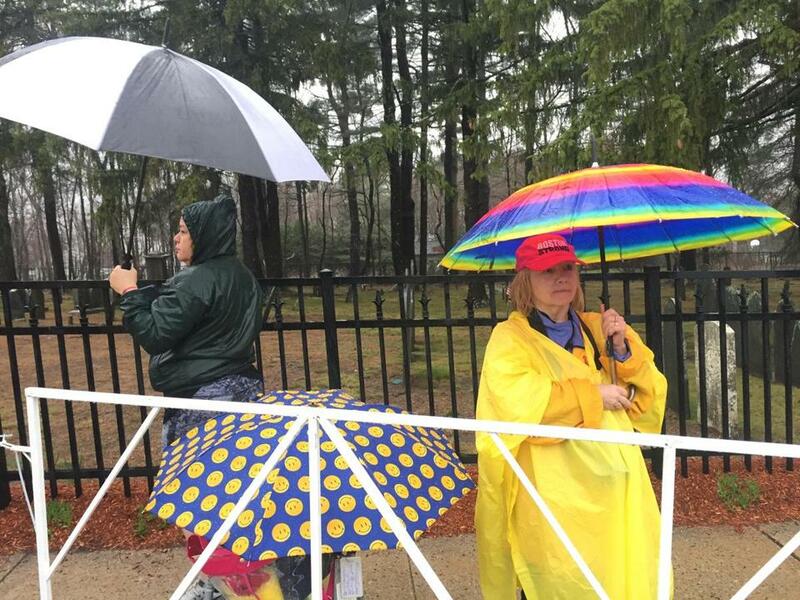 Cherry Scanzaroli (right) of Hopedale, waited near the start. She’s been a spectator for at least 25 years. The forecast for Marathon Monday has become more definite, and even though the weather will not be perfect, it won’t be a race-day washout. 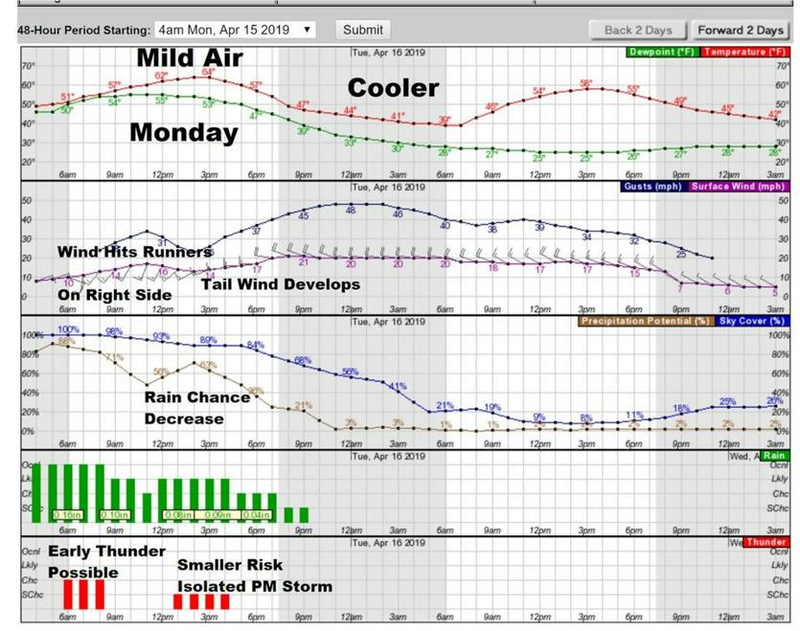 A week ago it looked like things would be stormy for Patriots Day, and the forecast still calls for part of the day to be unsettled, but a well-timed lull in the rain should favor many runners and wheelchair racers and likely even allow the Red Sox game to be played. The temperature also will be very mild. Clouds and some glimpses of sunshine today will give way to a very small risk of a couple of afternoon showers. There’s more than a 70 percent chance that you won’t see anything, but I want to mention it just in case. These showers will continue and become more numerous overnight tonight. 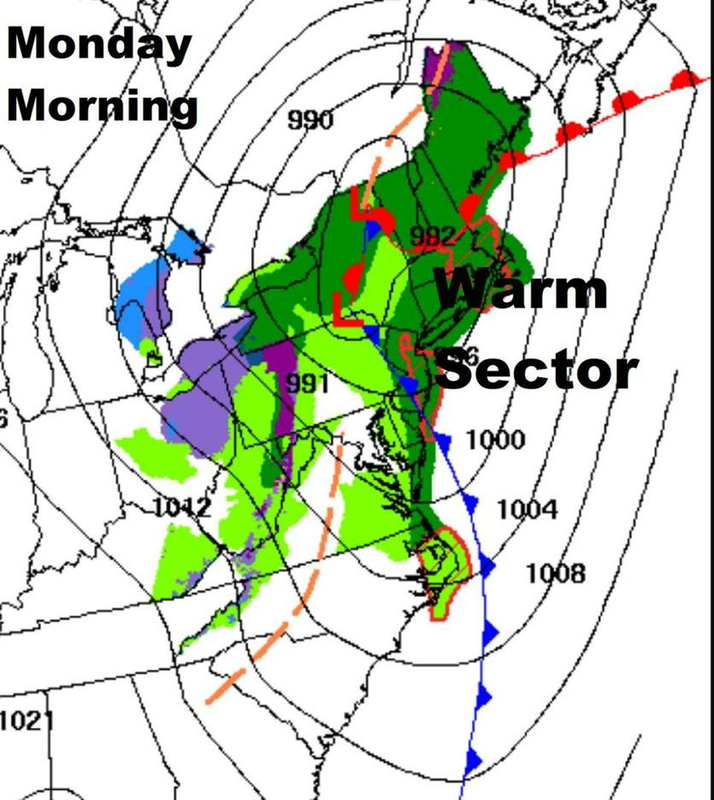 The wet weather Monday will be caused by a warm front pushing northward. This front is being pulled by low pressure moving into the Great Lakes region. That’s why temperatures will be so mild Monday. As this boundary between cooler air and warmer air reaches us showers will increase. Temperatures and humidity will also rise. Readings could be in the lower 60s Monday morning with a humid feeling in the air. Temperatures will be in the 60 degree range as athletes arrive in Hopkinton Monday Morning. Athletes and spectators alike can be prepared for a warm, windy, and wet (but not soaking) Marathon Monday. The transition into what meteorologists call the warm sector is what will bring the showers. Once the region is in this area, the showers will end and we will have a lull. This is also the time the race will be starting for many people. 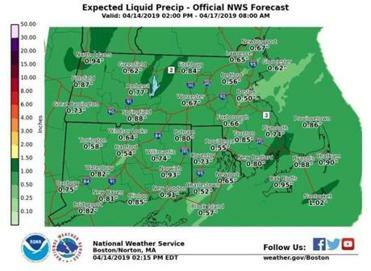 The wettest time of the day will be while the runners are gathering in Hopkinton, perhaps lasting until the wheelchair part of the race begins. These early-morning showers could contain thunderstorms along with brief high wind gusts. We won’t know exactly where the storms will be until Monday morning, but there is a chance of this occurring before 9 or 10 a.m. Remember, everything is moving west to east, so the line of heaviest showers will be following the race route, taking about an hour to move through it. There will be lighter showers before and after this main line. Mainly Dry 10 a.m. through 3 p.m.
Once this line of showers passes off the coast, we’ll see mainly dry and breezy weather. Winds will come from the south. I don’t expect these winds to be too strong, but they will be noticeable. 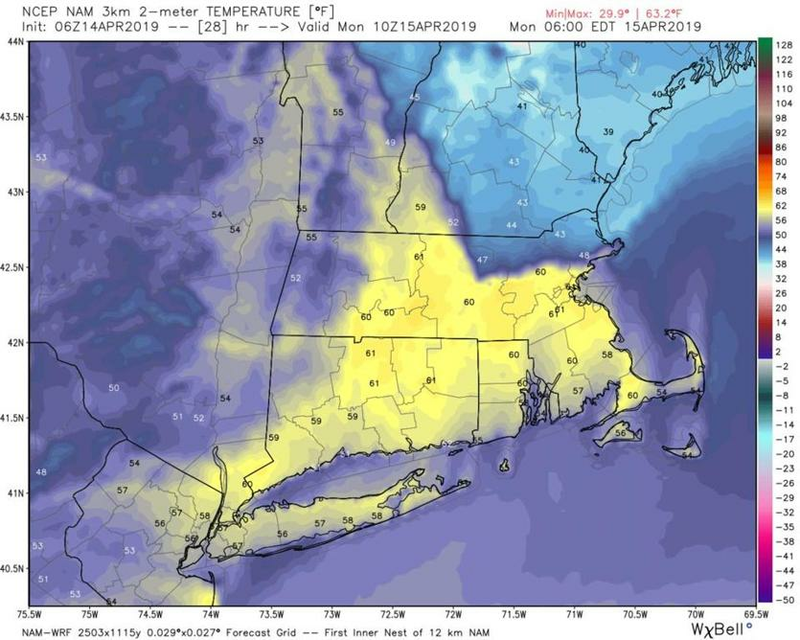 A cold front will cross the area in the afternoon, and this will flip the winds to the west, a tail wind for late runners generally after 3 p.m. I can’t rule out a stray shower in the afternoon, but any heavy downpours and thunderstorms will occur in the first part of the morning, not the afternoon. The bottom line about tomorrow is the greatest risk of rain will occur while the athletes are waiting for the race to begin and for the very earliest starters. Most of the race will be taking place under dry, but warm conditions with clouds and sunshine at times. Winds will be busy, but not overly strong until after 3 p.m when they will increase and gust over 30 miles per hour at times. Dry and seasonable weather returns for Tuesday.